This DVR is supper hybrid 5-in-1, supports Analog/AHD/IP/TVI camera. Step 1:Connect the DVR to camera and a Monitor. Step 2:Connect the DVR to internet. Step 3:Download free APP XMEYE. Step 4:Scan QR code to enjoy live viewing. Frame Rate: 1-25fps (PAL), 1-30fps (NTSC). Outputs: Support HDMI/VGA synchronously outputs. HDD: Support 1 SATA port,1HDD of 3TB. Audio Input/Output: RCA 4/RCA 1 . Browsers: IE, Safari, Chrome, Firefox, etc. Recoding Mode: Manual, Timing, Alarm, Motion Detection. OSD Language: English, German, French, Spanish, Italian, Japanese, Portuguese, Russian, etc. Network Protocol: ONVIF, HTTP, DHCP, PPPOE, DDNS, SMTP, FTP, RTSP. Multiple Viewing Options: view from a Windows PC/Mac book/Monitor or Smart phones via Free APP. 2.CVI cameras are special, better use CVI cameras alone. 3.For ONVIF IP, please go to main menu-system-channeltype to set first. 4.If your monitor is old,then please use VGA cable to connect. H.264 Main Profile HD CCTV DVR 8 channel Digital Video Recorder Home Security System dual-stream design, HDMI/ VGA output synchronously. Longer working lifetime with more reliable Hisilicon chipset and XM mainboard. Easy P2P setup in seconds with QR Scan -View Remotely anywhere anytime (LTE/4G function not ready yet) on your smartphone tablet or PC via Free XMEYE. (Download in App Store/Google play).Please search https://www.amazon.com/dp/B0734KF9XZ for larger adapter when you need 2TB or larger HDD. High compatible system with amazing DVR/HVR/NVR/TVI/CVI 5 in 1 Surveillance 8 ch AHD DVR. 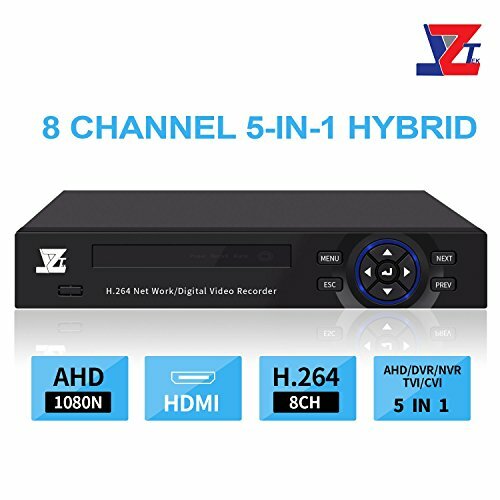 Easily upgrading your existing old D1/960H/720P DVR system with higher resolution 1080N Hybrid AHD CCTV DVR.Please search https://www.amazon.com/dp/B0734KSFFP for 720P AHD Security Camera, enjoy HD video now! Instant email will be send to you if there is any motion detected, so defense measures can be taken before it is too late. 1 Year Warranty free lifetime phone and email technical support.Please visit www.jztekcctv.com/downloads for online user manual & Technical Support. If you have any questions about this product by JZTEK, contact us by completing and submitting the form below. If you are looking for a specif part number, please include it with your message.